Get CM221 in the shops and in Digital now! Includes Vault download for all formats. Never miss an issue with a CM subscription, print or digital! Stuck in a rut? Can't get started? Can't even seem to finish a track? We're here to help! 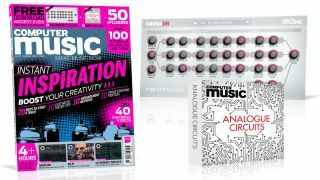 This month's Computer Music magazine is packed full of advice to help you unlock your creativity at all stages of the music-making process. Get a tiny taste of this gigantic feature with the video below, and get loads more with issue 221 of Computer Music. Pump your sounds full of grit, warmth and drive with a powerful VST/AU multiband saturation plugin - free only with Computer Music! CrossDr CM from Tek'It Audio splits the signal into three bands, with Drive, Warp, Crush and Clip controls to tailor your distortion flavour, and comprehensive levelling controls for the perfect balance. Check out CrossDr CM in the below video, and get this VST/AU plugin only in issue 221 of Computer Music. Read more on out CrossDr CM page. Get the organic imperfections of real-world hardware in your DAW with this huge collection of samples! Inside, you'll find almost a thousand loops, hits and instruments drenched in the sounds of coveted hardware processors and oddball effects. From dictaphone beats to stompbox basslines, you'll get the warmth and realism of classic, characterful equipment in this massive pack. Discover unconventional uses for your plugins in this unorthodox mixing and sound design showcase. Marvel at our real-time reverse-reverb simulation, our unusual approach to treble softening, grit-generating trickery, and other innovations. Free your mind, and your tunes will follow. Xfer Records' super synth has won plaudits from the music industry and the public alike, coming out as the #1 entry in MusicRadar's Best Plugin Synth in the World poll. Harness the full power of this immense synth over the course of our eight video tutorials. We'll get going with Serum's oscillators and filters, see how to edit its wavetables, and explore its limitless effects and modulation routing options. It's about time you gave Serum a try - check out what it can do in the video below. Fresh from the release of his new album, DLR - aka James Rowbotham -returns to the studio to give CM readers a first-hand look at how he goes about making music. This 90-minute video sees James rebuild his album track The Grip in Logic Pro 9, piece by piece, showing us how he arrived at his final arrangement and mix. Music Theory: We get right to the bottom of music this month, tackling the subject at its root with a look at the circle of fifths. David Zowie: Sure, he does House Every Weekend, but we've found out the five pieces of software he can't get through the rest of the week without. Win big with this issue of CM! Check out the full list of prizeson the competition page.